The Lockheed Constellation nicknamed the “Connie” first came off the assembly line in 1943 and the final Connie was completed in 1958. 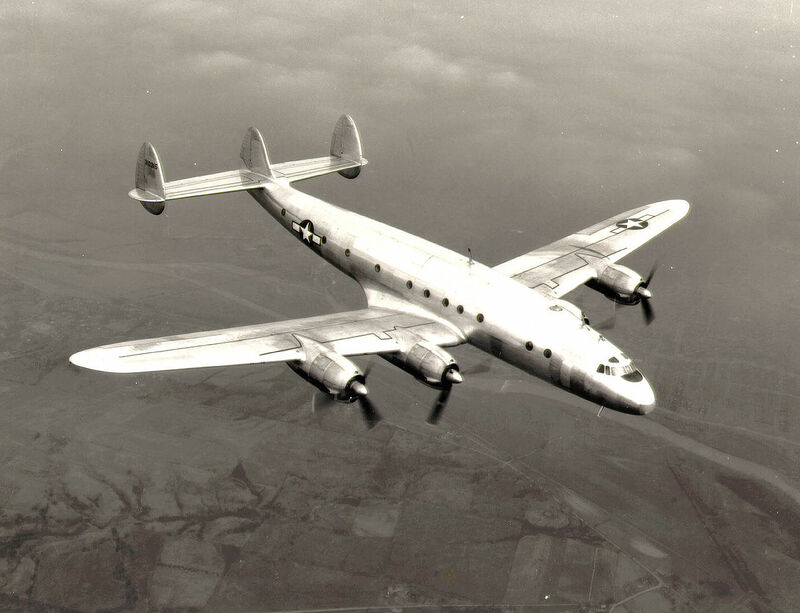 The Constellation was considered one of the best propeller driven aircraft of it’s time. There were 856 total aircraft with several variants both military and civilian built. The C-69 was the military version ordered by Army (USAAF) in 1942. The Lockheed Connie was featured in many old movies of the 40’s and 50’s. The younger generation will never believe that you could walk out to the boarding ramp of your flight without having to go through any kind of security or screening. The only reason a chain link fence was present was for safety. Even well-wishers seeing you off could go right out with you to the boarding ramp. Airline flying was a rich experience as food and beverage was superb, seating space was generous. However flying from New York to Los Angeles took 8-10 hours compared today’s 5 hours or less. But it was a much more enjoyable experience in the 1950s and early 1960s then it is today. Lockheed was working on a four engines, pressurized transport called Excalibur in 1937. Howard Hughes who was the major stock holder of TWA went to the bosses at Lockheed and wanted a four engined aircraft capable of flying 300-350 mph, 3,500 miles carrying 40 passengers which far exceeded the Excalibur project. Three of the company’s famous engineers, Kelly Johnson, Hal Hibbard, Willis Hawkins came up with the L-049 Constellation. The first prototype first flew on 09 January 1943 from Burbank to Muroc field, a short ferry hop, for testing. The USAAF had ordered 202 of the C-69 for troop and cargo hauling. But only 22 had been completed when the war ended in 1945. In the years after the war the C-69 was used to carry VIPs and was a key aircraft in the military’s airline Military Air Transport System (MATS) up until the early 1960s. TWA received it’s first L-49 in 01 October 1945. The first Trans-Atlantic flight from Washington, DC to Paris, via Gander Newfoundland and Shannon Ireland was on 03 December 1945. This was a “proving flight”. 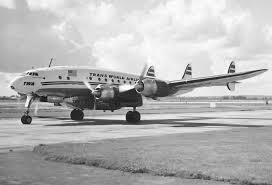 TWA’s transatlantic service started 06 February 1946 using a Constellation. On 17 June 1947 Pan-Am (Pan American World Airways) started it’s “Around-the World” service using a Constellation, named Clipper America and the call sign of “Pan-Am 1”. This flight continued until 1982 (of course using different jet aircraft as they advanced through the years). In the 1960s came the “jet age” with new jet aircraft such as Britain’s Comet, Boeing 707, Douglas DC-8, Convair 880 and Sud Aviation Caravelle just to name a few. 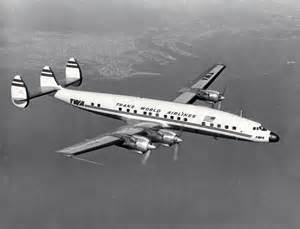 Thus the propeller driven Constellation was relegated to domestic routes in the Mainland. The last scheduled passenger flight of a L-1749 was on 11 May 1967 from Philadelphia to Kansas City. Although the aircraft continued as spare or back up on Eastern Airlines’ Boston-New York-Washington DC shuttle, the days of the Connie carrying scheduled passengers were over. Several air freight companies continued using the Constellation into the 1980s. The C-69 military version was Lockheed’s L-049 model. When the war came to a close, the civilian version was named L-149, the main difference between the two was the L-149 had more fuel tanks giving it a longer range. Then civilian upgrades with even more fuel tanks became the L-649 and L-749. Two unbuilt “drawing board only” models were L-849 and L-949, the latter was to be a “combi” with passenger seats and cargo capability. 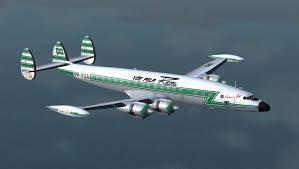 The L-1049 came into production as the “Super Constellation” with a longer or stretched fuselage. Other unbuilt and “drawing board only” proposals were L-1149 (turbine engines) L-1249, L- 1449, L-1549. L-1049H in the Airline History Museum Kansas City MO. L-049 at Greenwood Lake Airport, West Milford New Jersey. 2/L-1649 at Lewiston-Auburn Airport, Auburn Maine. L-049 (one the of first TWA aircraft) at Pima Air and Space Museum, Tucson AZ There two are other “Connies” at this museum: Dwight Eisenhower’s Columbine (VC-121A) and an EC-121T used by USN. L-1049G Super Constellation at Museum of Flight, Seattle WA. L-1649A Starliner at Fantasy of Flight, Lakeland FL. EC-121T at Peterson Air and Space Museum, Colorado Springs, CO.
EC-121T at Combat Air Museum, Topeka, KS.